Don't Go to the Cosmetics Counter without Me : A Unique Guide to Skin Care and Makeup Products from Today's Hottest Brands -- Shop Smarter and Find Products That Really Work! This book helps women find products that make them look great without spending a fortune. From drugstores and home shopping to department stores and catalogs, Paula Begoun and her team review the hottest skin-care and makeup products major cosmetic and skin-care lines. Regardless of the price tags, there are good and bad products in almost every line and with the turn of a page, readers can get concise reviews and fast answers in this completely revised edition. A user-friendly rating system makes it easy to find items worth trying. Paula also includes skin care basics and tips on which ingredients to look for so you get the results you want. Paula Begoun is known worldwide as The Cosmetics Cop for her role as a consumer advocate and investigative researcher on skin care and makeup. From an early age, Paula struggled with skin issues including acne and debilitating bouts of eczema. Frustrated by the ineffective treatments and products at the cosmetic counters and from dermatologists, Paula started examining the scientific research herself. Soon, she solved her skin problems by following published research on how skin works and which cosmetic ingredients really work. Determined to help others find the best products for their skin, Paula has written 19 books on cosmetics and is one of the best-selling beauty authors of all time. Her books Blue Eyeshadow Should Be Illegal, Don't Go to the Cosmetics Counter Without Me, and The Original Beauty Bible have helped women all over the world take the best possible care of their skin, while exposing what the cosmetics industry doesn't want you to know. In 1995, Paula launched Paula's Choice which offers skin-care solutions for everything from acne to wrinkles. With a devoted international following due to the quality of her products, Paula's Choice is sold in 52 countries. Always up for the latest Broadway show or Bollywood film (accompanied by a well-chilled martini) Paula lives in Seattle surrounded by her family and dogs. Bryan Barron has been working closely with Paula for 12 years. He spent many years working for various cosmetic lines in the retail sector, as a makeup artist, educator, and manager. 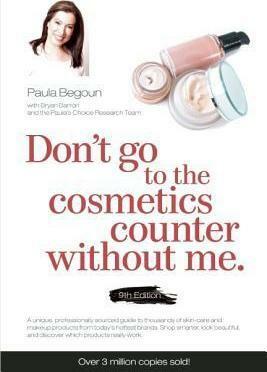 His first project with Paula was the fifth edition of Don't Go to the Cosmetics Counter Without Me. Since then, he has played an integral role in subsequent editions of that book along with The Beauty Bible. Bryan also served as co-writer and editor of Paula's former newsletter Cosmetics Counter Update. He currently manages and writes content for the Beautypedia and Paula's Choice Web sites and continues to evaluate the latest research with Paula and the Paula's Choice Research Team. A Michigan native, Bryan has lived in the Seattle area long enough to consider the Northwest home. Along with his husband Ben, he is a doting "Dad" to three Pomeranians, one of whom routinely accompanies him to the office. Desiree Stordahl is an ongoing contributor to articles concerning skin care and makeup at CosmeticsCop.com and has been trained under the personal guidance of Paula. Her writing flows from her passion for researching the cosmetics industry combined with her desire to help people find the best products for their skin. As part of the Paula's Choice Research Team, Stordahl's role includes evaluating cosmetic ingredients, investigating the physiological effects of skin-care products, and writing product reviews. She also travels around the world with Paula as a brand ambassador for Paula's Choice, educating consumers near and far about skin care. Stordahl was born and raised in Zillah, Washington and now calls the Seattle area home. She enjoys planning trips with her husband Jason, doing makeovers, and testing out her cooking skills on anyone who is willing to try her meals.